On a large baking sheet, dress the mushrooms, garlic and thyme with 3 tablespoons EVOO and spread out. Roast the mushrooms for 20 minutes, then remove from the oven and season with sea salt and pepper. Meanwhile, in a pot, combine the sweet potatoes and enough water to cover. Bring to a boil, season with sea salt and cook until fork-tender, 15 minutes. Drain and return to the pot, then mash with the stock and milk. Season with sea salt, pepper, paprika and hot sauce. Stir in the cheddar until melted. While the potatoes are working, in a bowl, toss the kale with the remaining 1 tablespoon EVOO and season with sea salt, pepper and a few dashes of nutmeg. Arrange the kale on a cooling rack set over a baking sheet and roast until crisp at the edges, 10-12 minutes (you may also steam or saute the kale, if you prefer, instead of roasting). 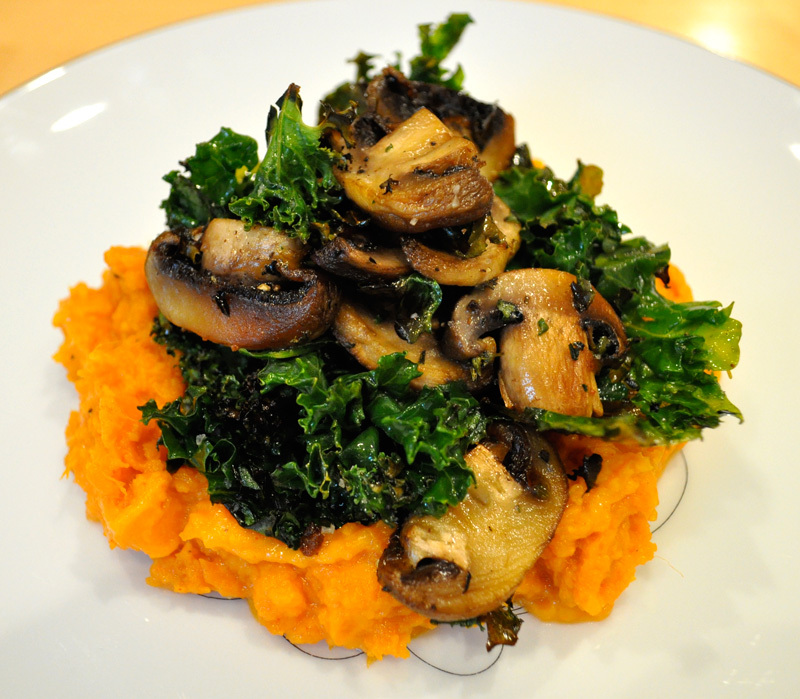 Combine the mushrooms and garlic with the kale and serve on a bed of sweet potatoes.